Do you wish to make your wedding day memorable? Would you like to experience a contemporary and unique way of going to your wedding? Our Limousine Service not only provides you with an excellent and elegant way of arriving to your wedding but we also assure you that you get there on time. Make your special day more memorable and perfect by traveling in style in one of our limousines. You can simply sit back and relax for our service aims to provide you with comfort and luxury on your special day. Our vehicle’s interior provides you; your bridesmaids and your gown enough space making you feel more comfortable during the travel. Maintain your beautiful looks in our climate controlled limos, so , no matter how tensed you are or even if you are getting wed on a hot summer morning, you will still arrive at the wedding looking fresh and beautiful as ever. We would like to contribute to your wedding’s success by making sure that your limousine of choice is accessorized meticulously according to your preference and specifications. 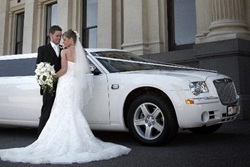 Hire Limousine London for your wedding day now and call us at 020 3006 2092 and talk to our customer services team.